What you see in the above photo is a classic symptom of decades of car-centric planning. A wide, rounded corner that expedites the movment of cars, without jeopardising their speed. Wide sidewalks narrow at the corner, where bicycles are often parked. It is a prime example of The Arrogance of Space. It's the corner of Gammel Kongevej and Skt. Jørgens Allé. 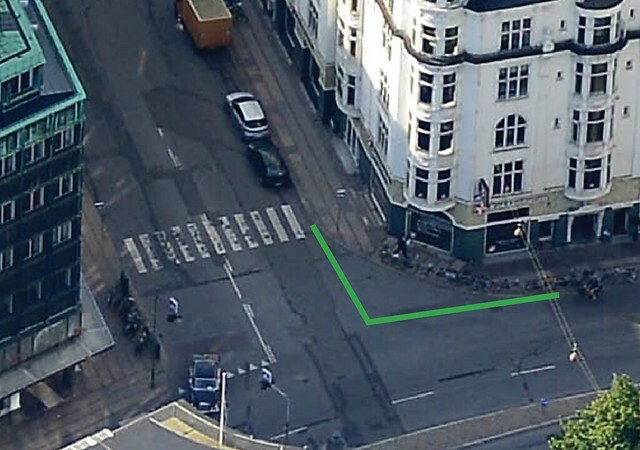 It is possible that this corner was designed as such for the tramways of Copenhagen that operated in the city from 1884 to 1972, when one of the most destructive Lord Mayors in the history of Copenhagen (in an urban planning sense) - the ironically named Urban Hansen - killed them off. I've been unable to find out which tram route might have turned down this street at this intersection. Nevertheless, this corner remained unchanged ever since. I know this spot well. It's always been an irritating bottleneck, especially when walking with a baby carriage, as I did often when Felix was a baby. There is little need for this corner. As the green lines indicate, there is a considerable amount of space that is unused. There is a cycle track on the street running left to right - you can see a cyclist at bottom right. To be honest, it was a great corner for cyclists, too. Too much speed, however, coming around that corner wasn't good for pedestrians at the crosswalk. For the twenty years I've lived in Copenhagen, this intersection remained unchanged. Until recently. Today, to my pleasant surprise, there has been an intervention at this location. 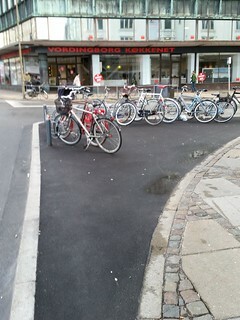 The City of Copenhagen decided to right a wrong. As you can see from this photo from today, the rounded corner has been sharpened off to a 90 degree angle. The usual, strict design guide regarding sidewalk design in the City was not adhered to in the built out section, but let's let than one slide. New curbstones were put in and the area was filled out with asphalt, widening the sidewalk nicely. 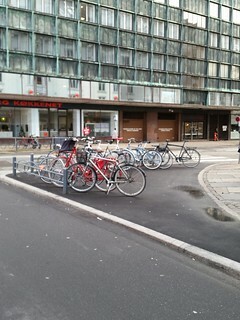 Racks for 15 bicycles were put in, providing a further buffer against the traffic. In addition, at bottom left there is a build out towards the traffic, narrowing the street further and creating another buffer. The cycle track was widened at the same time. Not as wide as in many spots in the city, but still enough for conversation cycling - two cyclists cycling and talking and room for another cyclist to overtake. A simple solution. Reversing the Arrogance of Space in one location. It's not a complete painting, but it is a good stroke of colour. In my perfect world, however, pedestrians wouldn't be forced to do a dog's leg - instead moving the pedestrian crossing to the corner to allow them to continue along a straight desire line on this route to the city centre. The location is, however however, safer, slower and better. 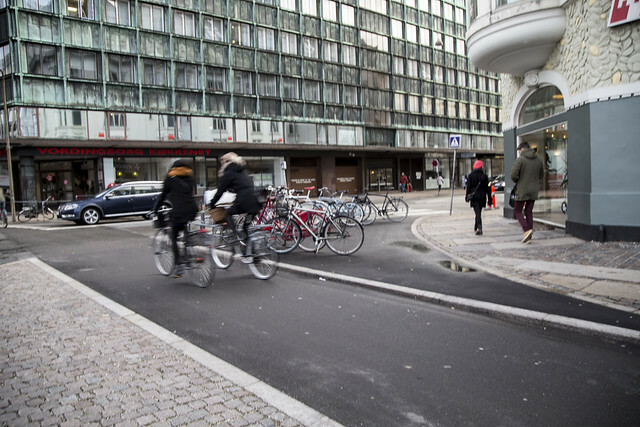 Here are some other examples from Copenhagen of narrowing the road space for cars and adding bicycle racks.